Since the supposed weekend getaway at Club Manila East had been canceled, me and my friends decided to meet up and have dinner at Eastwood. 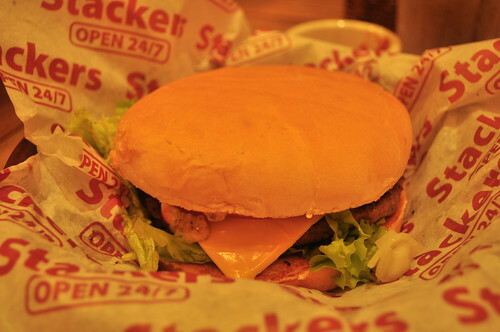 We don’t have any preferences to eat that’s why we ended up at Stackers Burger Cafe. It was my second time here, and I was satiated on my first time. It is open 24/7 and it has a branch on Piazza. 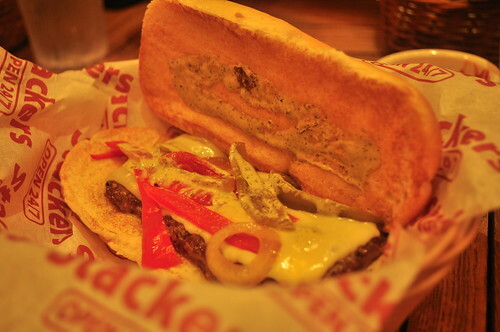 Stackers Burger Cafe is about great burger and great food on a new casual style dining concept. 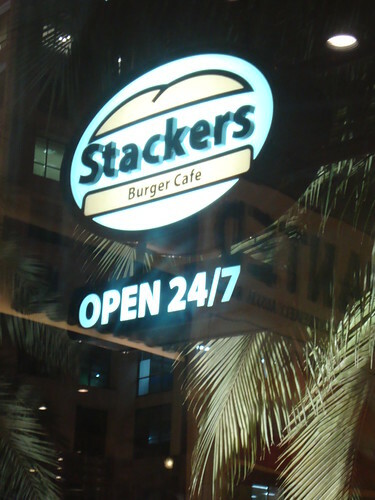 The price is a bit pricey compare to our common McDonald’s and Jollibee, but when I say Stackers, it’s simply Auss’m burger. I forgot what was my order last time and I wanted to try something new. 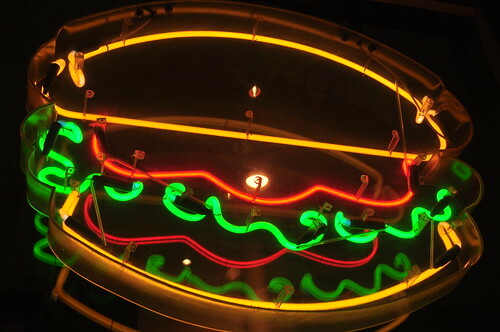 Of course, this is a burger cafe, we need to try their specialty. 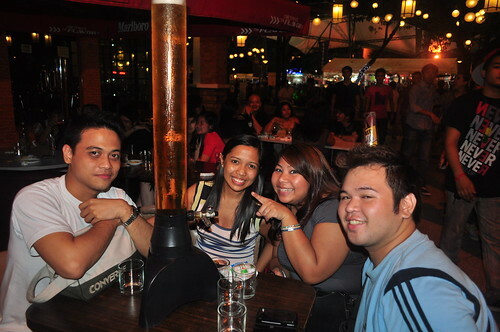 Since the BF-GF Patrick and Steph share on their orders, me, Vane and Darren also decided to share on our orders. We ordered 3 pcs. 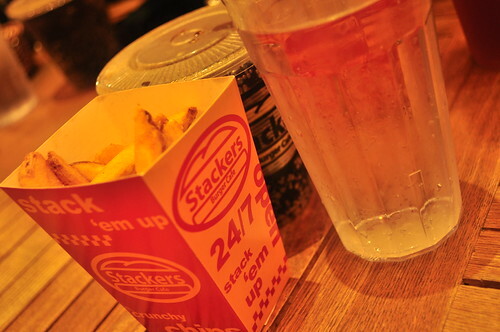 Chicken and Chips, Stacker’s Cheese Burger De luxe and Philly Cheese burger. Yum! We are all satisfied with our food but not with service. The staff are inattentive but we still love Stackers! The place is cozy. 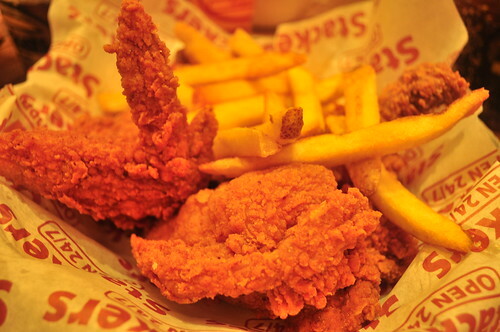 The chicken parts are big even the wing part. The burger and fries are awesome but I haven’t tasted the Philly Cheese Burger because I was busy taking some pictures. After we indulged with so Auss’m food and burgers, we moved and proceed to our next destination. After several discussions and attempts, we ended up drinking in Cheesecake Etc. Is it because of the manager who caught our eyes!? Just wondering! Lol! Me and Patrick went to 7-11, we bought chips and peanuts for our pulutan. We placed the peanuts on a tissue and covered it with another tissue and placed the chips on Patrick’s bag. When the manager passed on our table, we are all still and a bit uneasy. Then the manager told us, “OK lang, do you want plate?”. 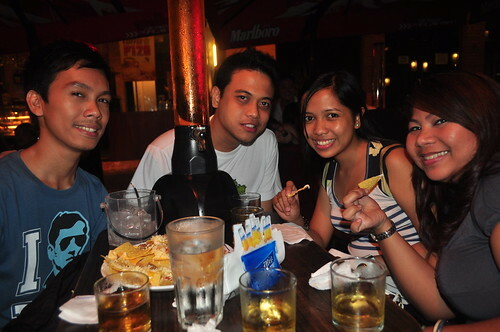 And we all said, “Ok lang…” Hahaha… That was a funny moment. I didn’t drink a lot since I’m still going to book online for the Cebu Pacific’s 10-10-10 promo however, I was already sleepy when I arrived home. I was able to book only one!